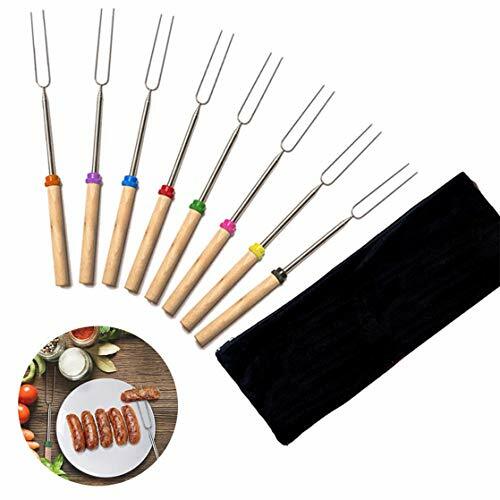 Marshmallow Roasting Sticks Extending Roaster Set of 8 Telescoping Smores Skewers & Hot Dog Forks 32 inch Fire Pit Camping Cookware Campfire Cooking Kids with Free Bag by Heart Horse at Kerinci. MPN: mini9. Hurry! Limited time offer. Offer valid only while supplies last. REMIUM QUALITY MARSHMALLOW STICKS: Our Marshmallow Roasting Sticks are made from Non-Toxic Heat-Treated FDA Approved 304 Stainless Steel, guaranteed not to rust in time. EXPERT APPROVED SAFE FOR CHILDREN: Experts recommend our 32 inch telescoping forks and advise parents not to purchase common 22 inch non-extendable marshmallow roasting forks in order to keep children a safe distance from any patio fire pit. EASY CLEANING AND STORAGE: Ideal for making the perfect smores, sausages, wieners, hot dogs and even vegetables or fruits. Retracting design to 10 inches and canvas pouch are convenient for camping trips or storing at home. PERFECT GIFT for FAMILY and FRIENDS: Best Marshmallow Roasting Sticks for anyone looking for a high quality, great value product to enjoy at the cookout with the people you love. If you have any questions about this product by Heart Horse, contact us by completing and submitting the form below. If you are looking for a specif part number, please include it with your message.